Pay your Ambulance Bill ONLINE here! Regular training is held the 2nd & 4th Tuesday of every month. Call for info. NOTE: NH law prohibits backyard trash burning. The Town of Lancaster has certain requirements which must be met in order to burn materials. Most of these requirements are regulated by state law. Smoke Alarms / Detectors: Test your unit monthly and follow these other smoke detector safety tips. Carbon Monoxide (CO) Risks at Home: learn more about your risks of CO poisioning and how to protect yourself. Escape Planning: You never know when or if you'll need to escape a fire in your home. But with this simple escape planning checklist, you'll be ready. 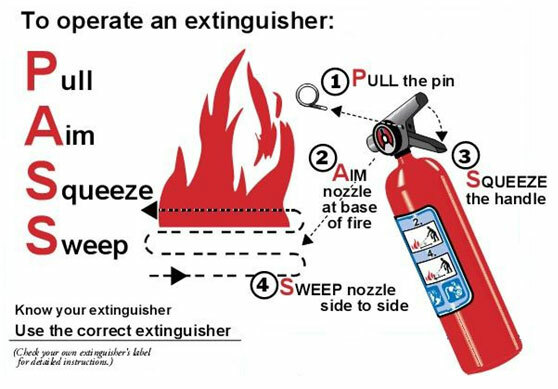 How to Use a Fire Extinguisher: P.A.S.S. stands for Pull, Aim, Squeeze, and Sweep. Watch a fire marshall demonstrate the PASS technique. The Boy Scouts of America (BSA) Explorer Program was established to allow youth who are interested in a career in Fire/EMS to work under an advisor. Explorers are allowed to respond to both EMS and Fire calls. In order to be part of the program, Explorers must achieve at least a "C" average in school, be at least 14 years of age, and have graduated the 8th grade.